Temporal Environment or Temporal Setting – What is a Progressive School? The school’s learning environment is not only physical. It is also temporal. The progressive school’s learning environment also concerns the temporal setting or timing for transitions, the routines and the activities (Gordon & Williams-Browne, 2000). The schedule has a balance of quiet and active, group and individual plus outdoor and indoor activities. The progressive preschool class is not scheduled by subjects (i.e. Math, Science, English). It is scheduled by routines. The progressive preschool definition of a routine is similar and yet very different from that of Merriam-Webster’s. The dictionary defines a routine as a habitual or mechanical performance of an established procedure. It is crucial that routines be done daily in the same order specially during the first few months of school to make the child feel more secure in class because he can predict what will happen next. I disagree, though, with the dictionary’s definition of a routine being mechanical in the progressive preschool schedule. Although it is habitual, the progressive routines are not at all mechanical but very dynamic. It is also a mix of noisy and quiet activities, in line with a child’s biorhythm. The next post will tackle each routine in detail. Posted on November 17, 2008 February 20, 2015 by teachertinazamora	This entry was posted in temporal environment and tagged temporal environment, temporal setting. Bookmark the permalink. 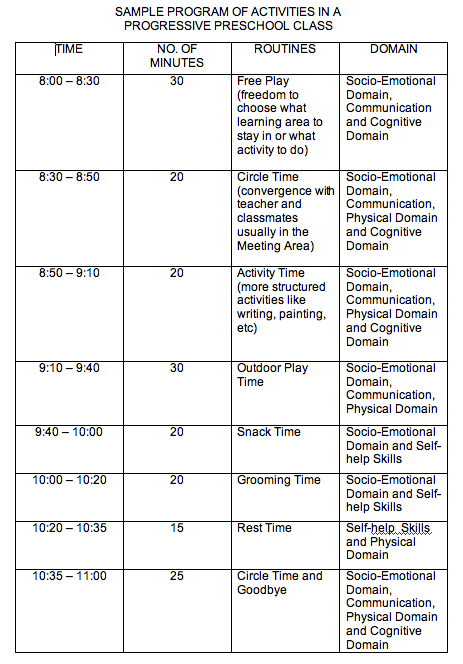 Pingback: Routines of the Progressive Preschool Class: Free Play « What is a Progressive School? Pingback: Scouting for a School Series (SSS): The School’s Philosophy « What is a Progressive School? Can you provide the full reference for Gordon & Williams-Browne, 2000? Thank you! This blog has been very useful, but I am interested in learning more.